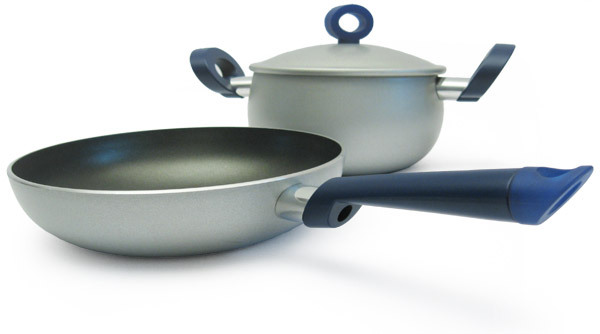 Yo-yo is a complete set of aluminium non-stick pots and pans. The design intervention has been radical and has concerned the design of the shapes of the pots, of the lids, of the handles and of the knobs. The bakelite handles have an elliptical ring shape, are fixed to the pot and protected by a flamebreaker aluminium nut. They are very ergonomic and they can be held both by grasping the handle and by slipping the fingers into the holes. Instead the knobs are made of polypropylene.The handle is made of bakelite, fixed to the pot and protected by a flamebreaker nut. Its design with elliptical section assures a safe taking and a very good manipulation, useful for those workings that usually take place in the frying pans or in the saucepans. The polypropylene end finishes the handle with a useful hole for hanging the pan and it also reminds of the shape of the knob. 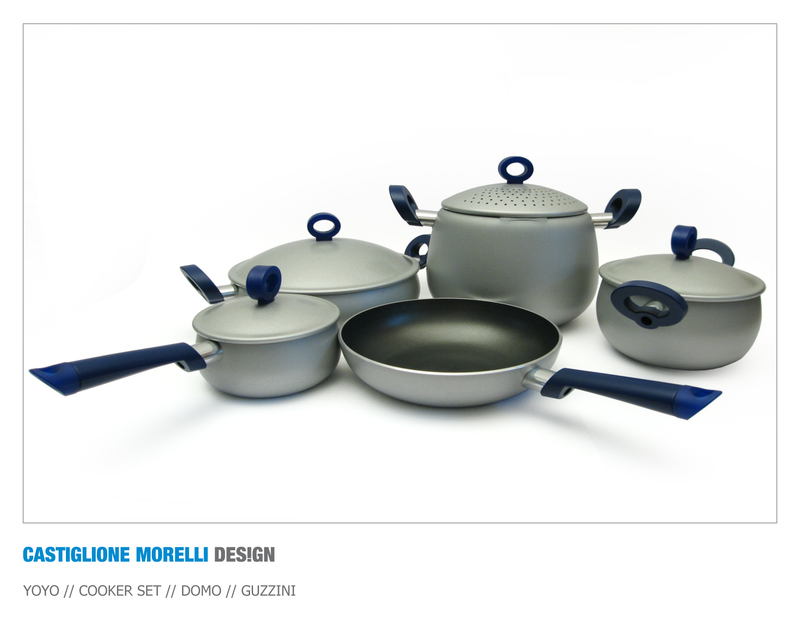 The set includes many pieces: saucepans with two handles, pots, little saucepans and pans, in different diameters and all provided with lid. Besides there are special pots too: a wok and a pot for cooking and straining the pasta. The set is produced in different colours: metalized silver painted with blue handles or metalized black painted with silver painted handles and grey/blue ends. The pots are so much fine and polished that can be used to serve directly the dishes or show off on kitchen top.